The first funerals of the Lokomotiv ice hockey players killed in a plane crash near the Russian city of Yaroslavl have been held on Saturday. Families and fans have also paid final tributes to the victims at a ceremony at the team’s home stadium. 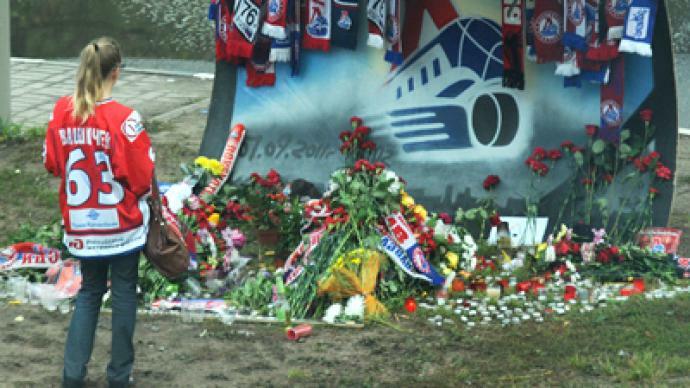 After a remembrance service at the “Arena-2000”, where the team practised just a day before the fatal crash, the bodies of 14 Lokomotiv players were buried at Leontievskoye cemetery in Yaroslavl. The bodies of two more players have been sent to the town of Rybinsk in the Yaroslavl region. The remembrance ceremony was attended by over 100,000 people. According to Interfax, in order to honor the deceased sportsmen, the region’s government conducted the funerals in accordance with military ritual as a military orchestra played at the cemetery and soldiers saluted with three shots in the air. A Russian Orthodox funeral service was conducted for several victims in a cathedral in Yaroslavl before the official ceremony at the “Arena-2000”. It was a private service with only relatives of the deceased allowed to attend. Saturday is the third official day of mourning. 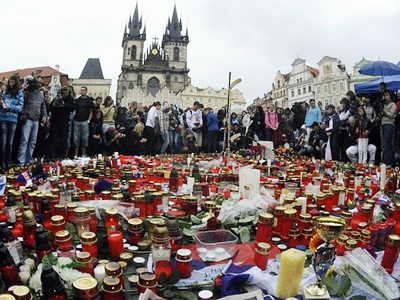 The city has seen thousands come to visit in memory of the victims. Prime Minister Vladimir Putin and other officials came to pay their respects along with many fans and hockey teams. A special train for those who wanted to pay their last respects to the athletes was deployed from Moscow to Yaroslavl. The accident, which has sent shock waves through Russia and many countries abroad, claimed the lives of several international players who played in the Kontinental Hockey League, Europe’s biggest club competition. All of them are to be buried in their hometowns, with all the Ukrainian players hailing from Kiev. The bodies of the three Czech players, Jan Marek, Josef Vasicek and Karel Rachunek, were flown home on Friday afternoon. In memory of the victims of the tragedy, two memorials are planned: one at the crash site near the village of Tunoshna, where the plane crash took place; and the other outside the Arena ice palace, Lokomotiv’s home base. 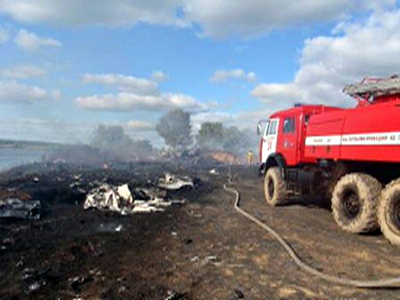 At least 43 people died when a Yakovlev Yak-42 passenger plane crashed near the city of Yaroslavl in Central Russia on September 7. The majority of victims, 37 people, were members of the local ice hockey team. The remaining victims were from the flight crew. Specialists continue working to extract information from the flight recorders of the ill-fated aircraft. The first clues as to what could have led to the tragedy are beginning to emerge from the investigative committee. According to preliminary results, the engines on the plane were fine, and according to the Federal Air Transport Agency’s (Rosaviation) low-quality fuel could not have been a reason for the tragedy. 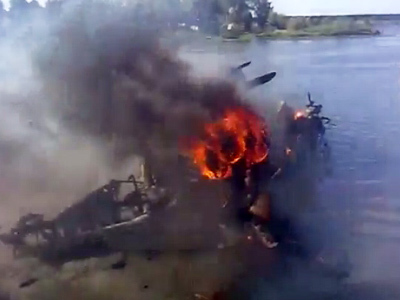 Watch video from the mourning ceremony in Yaroslavl. ­And as a city continues to mourn, the Lokomotiv youth team have chosen to honor their heroes in a unique way – by getting back on the ice. “The coach told us that we should go out on to the ice and play for all the guys who lost their lives in this crash. He told us to win for them. We need to play our best. ” Mark Solyankin-Pasternak, Lokomotiv youth team player, says. For the young players practicing on the Arena-2000 ice rink, it has special significance as the lost team played there in their final match. For the next generation for Lokomotiv players it is not just about re-building the team for the future of the city. It is also about getting back on the ice as a form of therapy to get them to get through the grief. “I have a strong desire to win the [KHL’s] Gagarin Cup now, to win the youth championship and dedicate the victory to my friends, who died,” Kirill Kapustin, Lokomotiv youth team player, says. And an even younger group is ready to follow in their footsteps. “Some of the players who died were from our school. They told us about them in class. One boy who later played in the team got topped mark at school. I want to be in the new team that will repeat the success of Lokomotiv. Next week I am scheduled to try out for the club. The coach is going to come right to our school,” Sasha Vasin, a Lokomotiv hopeful, says.